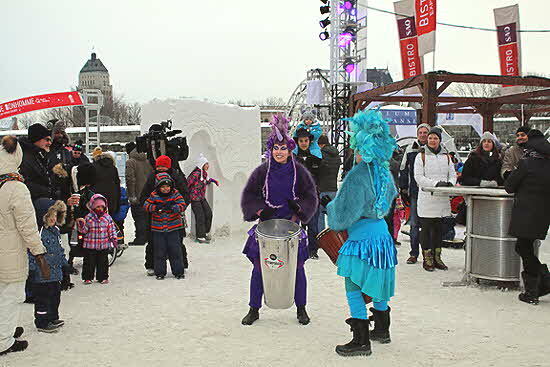 Quebec City’s annual Winter Carnival is what they mean when they use the phrase “winter wonderland”. I experienced it this January, and while the temperatures were frigid, the hospitality was anything but. I attended the Carnival’s opening night ceremony, which included the crowning of the Carnival’s Queen by the spiral-shaped ice palace at the Carnival’s central site. After sunset, the palace became interactive with a colored light show reflected on the ice walls. Nearby, there was an ice bar, food stands, ice skating and sledding, live music, graffiti artists, ice sculptors, and more. The Carnival lasts almost three weeks, so there are a wide variety of festivities to check out. The ice and snow sculptors work throughout the Carnival on their art, and they’re judged in a contest toward the end of the celebration. You can take an ice sculpture workshop too, to learn how it’s done. If that doesn’t interest you, there’s axe throwing and a mechanical moose. At different locations, there are opportunities to play camp games like giant foosball or pet caribou and other animals. Other activities this year included a videotron music box, storytellers, floor hockey, ice slides, lumberjack challenges, and logger demonstrations. The kids (including the grown-up kids) can even help chop the logs. 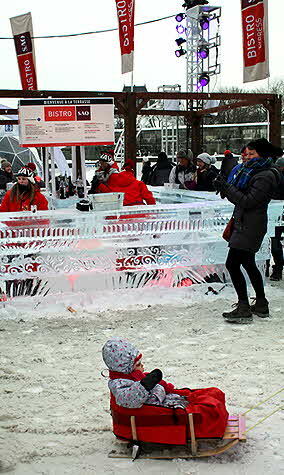 Speaking of the kids, I was amused to see parents transporting their little ones around the Carnival in sleds. In the snow, this was a much smarter option than strollers. Not far away at Village Nordik, you can try ice fishing. 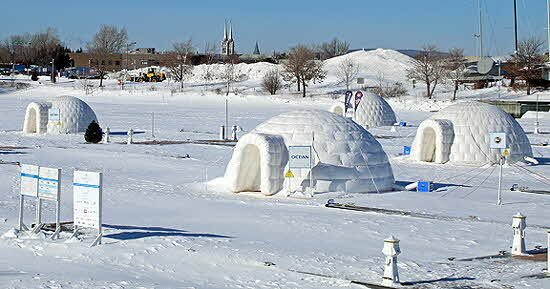 White inflatable igloos are set up on the Louise Basin at the Port of Quebec. You can sit inside an igloo, and they’ll drill a hole for you to fish. Then, they’ll cook the fish for you, and you can have a full meal on site. Of course, for true snow bunnies, skiing isn’t far away, and don’t miss the ice hotel (Hotel de Glace) and the adjacent Valcartier Vacation Village. They’re a bit outside the city but well worth the drive. 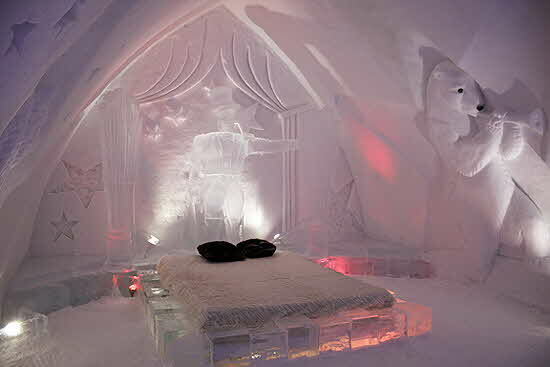 I had always wanted to see an ice hotel, and this one did not disappoint. I didn’t have the courage to try the ice slide within the snowy hotel walls, but I did try the cranberry and vodka drink at the ice bar, drinking out of a glass made of... you guessed it... ice. If youâ€re adventurous, you can spend a night at the hotel in an ice bed on top of what we were assured was a warm mattress under a heavy comforter. Or you can just tour the hotel and then take advantage of the shops and restaurants at the village. There are plenty of winter activities at the village as well, including slides with inner-tubes, skating paths, snow rafting, and mechanical lifts. 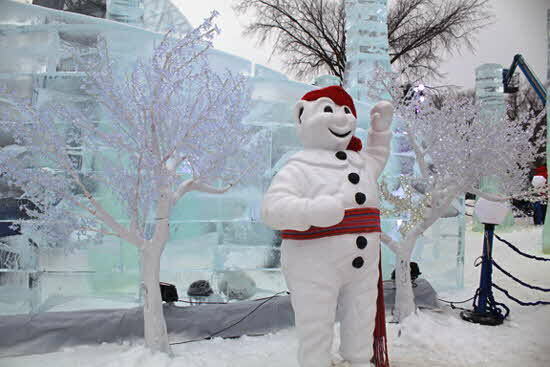 Overseeing the Carnival is always Bonhomme, a snowman character in a red cap. You’ll see his likeness all over the city, where you can take selfies with him. Your ticket for the festivities is a “Carnival Effigy” that you wear around your neck, and the arrowhead sash that comes from Amerindian folklore is a must. It’s what you see around Bonhomme’s waist. For places to stay during the Carnival, see my review of Le Chateau Frontenac, which is having its 125th anniversary this year. Just outside the old town is the Hilton, which has a fantastic executive lounge on the top floor with panoramic views of the city. When you get hungry, I highly recommend La Buche restaurant (on rue St. Louis near the main Winter Carnival site) for traditional Quebec cuisine in a relaxed atmosphere with live musicians. It serves breakfast, brunch, lunch, and dinner. My favorites at our dinner were the maple bread pudding with foie-gras and bacon, and the Quebec shepherd’s pie with fruit ketchup. (I now require all shepherd’s pie to have fruit ketchup). For dessert, try the maple fudge or maple taffy on snow. I met some people from the U.S. who were attending the Winter Carnival for the third year in a row, but this isn’t an event for everyone. You need to truly enjoy winter. 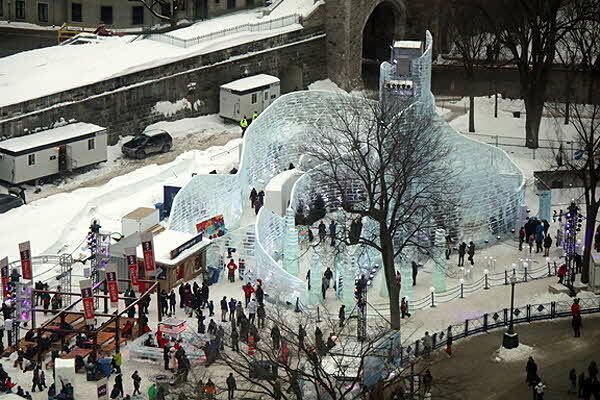 Quebec City has considerable snow and ice throughout the season, and the city is hilly. So you need toe warmers and excellent snow boots, as well as a snuggly coat. It was seven degrees Fahrenheit when I arrived but rose to just below freezing by the time I left a couple of days later. Earlier this year, the temperatures in the city were double digits below zero. If you don’t mind the cold and snow, however, there are few, if any, places as beautiful in winter as Quebec. The French architecture covered in snow with the horse-drawn carriages throughout the historic part of town will keep your camera busy, as the friendliness of the locals helps you stay warm.